The Falcated Teal is native to Siberia and northern China during the breeding season and winters in suitable habitat over much of China and as far south as northern Japan. The Falcated is one of the lager teal and a male in full breeding plumage is a stunning sight and if a number of pairs are kept together their communal courtship displays can be seen from December through to the start of the breeding season. The males will almost constantly be trying to impress the females with their high pitched whistles and incredible manoeuvres designed to highlight aspects of their plumage. Falcated Teal are reasonably straightforward to maintain in captivity and feeding is simple on the usual wheat and pellet diet. However they do also appreciate grazing and would probably not be well suited to an enclosure that did not provide access to grass but this could perhaps be substituted with lettuce, spinach and brasica leaves if grass was in short supply. These teal are very hardy and can be long lived and I have certainly had individuals that have lived to around twenty. Given time they will certainly become tame and confiding but they are more inclined to be nervous than many other species of waterfowl. The Falcated is perhaps the only dabbling duck that may require access to good quality water to avoid getting wet feather but this may also be caused by inbreeding. While Falcated have always been well represented in captivity they have never been overly abundant and while not difficult to maintain they are perhaps not as straightforward as some species. Falcated appear to have a very restricted breeding season and different weather conditions do not seem to have any influence on when the first eggs are laid. Over the years I have had a number of different females and I think i can say that without exception they lay their first egg between 10th and 15th May. They can usually be expected to lay in their first season but in my experience if they have not laid by 15th May then they will not lay that season. The clutch consists of six to nine creamy buff eggs that are usually laid on consecutive days, natural sites in dry grass etc under or near a bush or tree appear to be favoured but they will also use ground boxes with a reasonable sized entrance hole. Unusually in over twenty five years of keeping Falcated I have never had a female lay a third clutch but if the first clutch is taken they will usually happily produce a second clutch. Incubation takes twenty four to twenty five days. Virtually all of my waterfowl are reared in brooders but I do find that Falcated while easy to start in a brooder do not grow on as well. Consequently Falcated are the only species that I still rear in a coop and run situation on grass with a broody hen. Falcated ducklings can be nervous and the broody hen will help to calm them but more importantly I think it is access to grazing and exercise throughout the rearing process that really helps produce a fit well feathered bird. Many Falcated, especially if reared in brooders will get brakes in the feathers on their breast and the down will be exposed. This is not necessarily a problem but if at this stage they are not kept clean these breaks in the feathers can develop into a patch that is not waterproof and this can then lead to further complications and possibly wet feather as the first winter approaches and then looses can be expected. 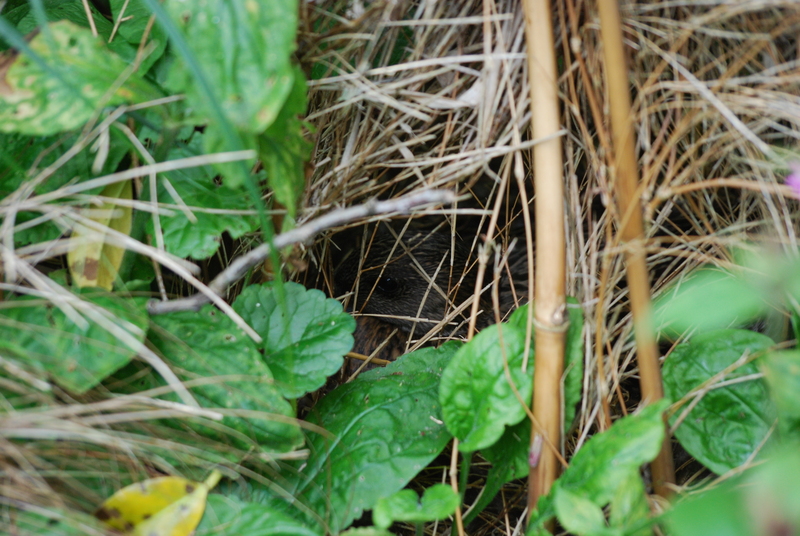 Nesting female Falcated Teal in a well concealed natural site. Falcated will use ground boxes but prefer natural cover.